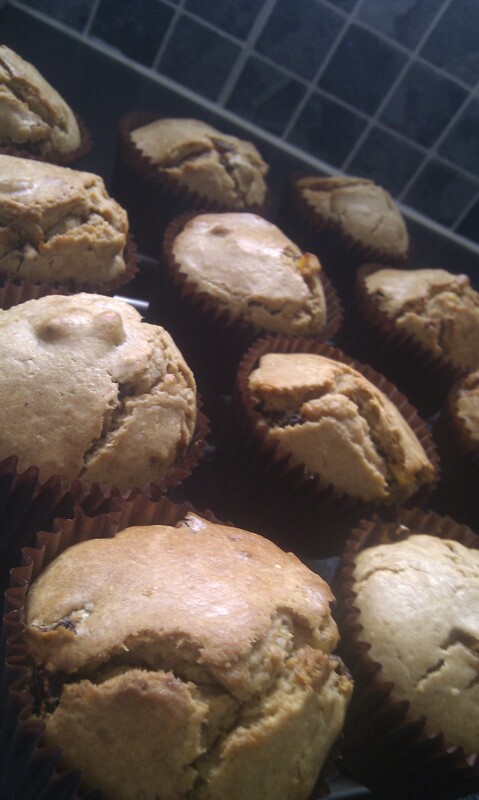 Today my husband was doing his work so I decided that I would use the time to make some very quick muffins. Usually I make my triple chocolate chip ones but this time I thought I would try a different flavour combination. Looking around at what I have in the house I was originally going to do some lemon muffins, but I quite fancied them with poppy seeds in and I don’t have any, so I had a thought about making muffins that taste like Christmas cake. I get pretty excited when it comes to Christmas and since the heating has just gone on, it was a very cold and rainy day, I was feeling kinda Christmassy! Unfortunately my husband said he couldn’t really taste too much in these muffins but he currently has a cold so I’m hoping that when he gets his full taste buds back then he will enjoy them better. I thought they did taste a bit like a Christmas cake and I was really pleased how they worked. I think next time I might also add a little bit of Amaretto liqueur to the mix or some brandy. In a bowl put all of your dry ingredients, these are flour, sugar, nutmeg, cinnamon and baking powder. Mix your butter/margarine into the dry ingredients till all of the butter is blended in. In a separate bowl measure your milk and beat into the milk the two eggs. Add your splash of liqueur. Mix the wet ingredients into the dry and stir till they just come together to make a sticky mix then stir in the mixed fruit. Remember at this stage not to overwork the mix. Separate your mix into 12 muffin cases, making sure you fill them about 2/3rds of the way up the cases. Bake in the oven for 25 minutes or till a skewer comes out clean.